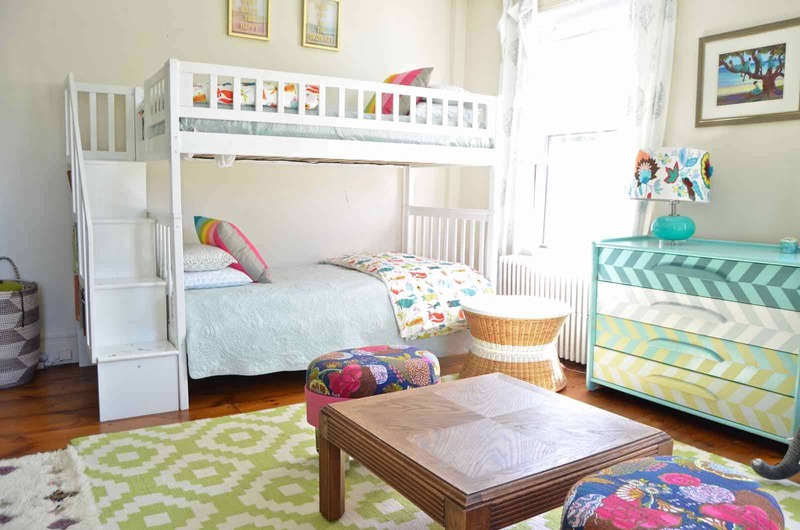 A colorful shared bedroom for our two daughters… rainbows and reading and make believe. When we moved into this house a couple of years ago, Louisa was still in a crib! She had her own cute little room and Martha got a palace! 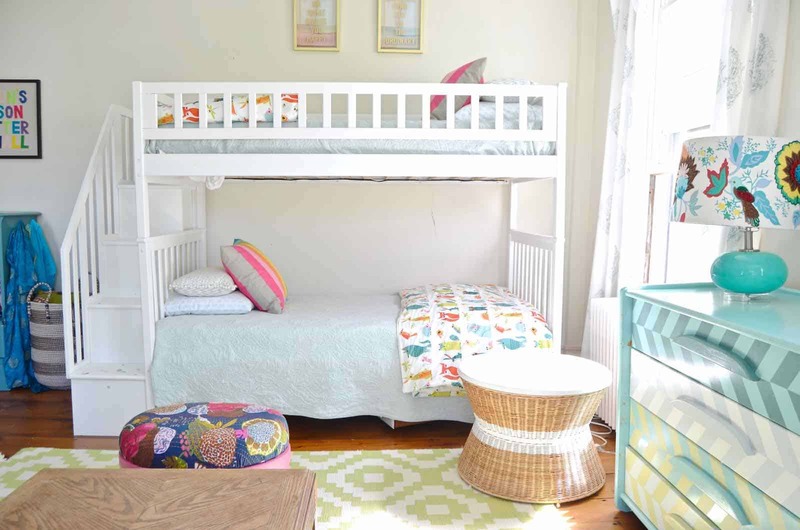 Louisa’s room transitioned her from a crib into a bed, but it was TIGHT. 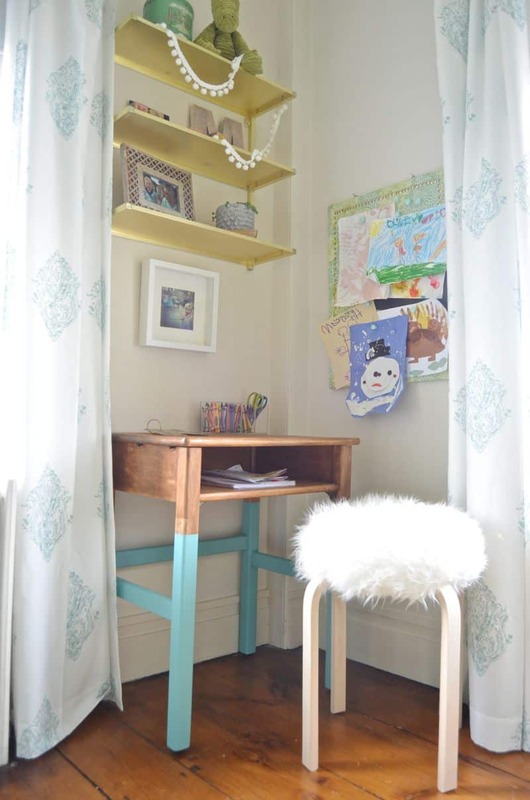 And Martha’s room got a few little changes like a corner desk area, but not a lot of attention. Until NOW. The girls have been begging to move in together so midway through the summer, we let the permanent sleep over begin! They were already waking each other up every morning, so we figured letting them bunk together might help the rest of the house get a few more moments of shuteye every morning. 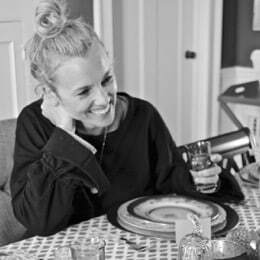 The room didn’t need a ton of furniture but… I wanted to rearrange a bring in a few little things so Louisa felt like she wasn’t just moving into Martha’s old room. 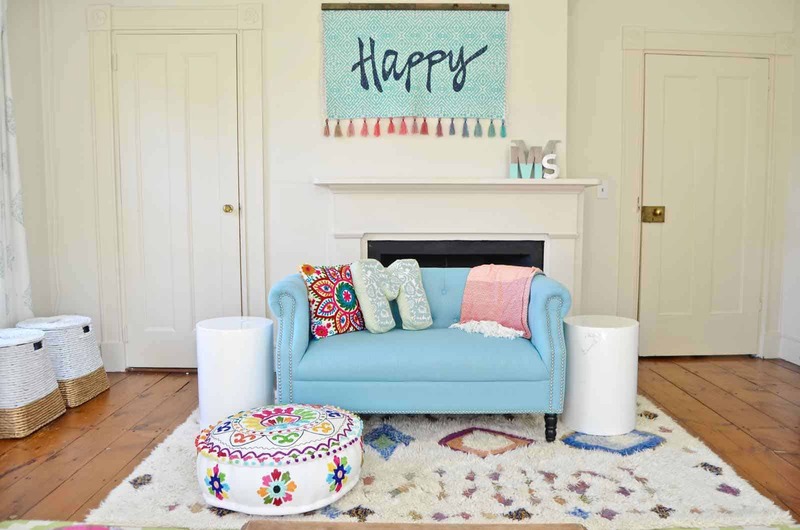 When I asked the girls what they wanted, their answer was “rainbow”… so I carried on with my original direction and just kept layering the colors around the room. Much to my chagrin, Martha wanted me to move out the large DIY ottoman in the center of the room. It’s one of my faves, but… it’s their room so out it went. I wanted a place for them to sit and draw, etc. and the two doll houses quickly found their way into the center of the room. That bench seat along the wall is an Ikea shelf that I upholstered and added legs to. It’s a perfect seat and storage area for the jillions of tiny toys that seem to come with little kids! Hanging over the bench are those two DIY light boxes. I wrote a post about Martha’s and just posted a tutorial on my YouTube channel about Louisa’s. I mentioned the little corner desk area. Martha helped me paint that desk and she’s started to sit over there to do her coloring or stickers. Of our brood, Martha and Louisa are the only two siblings who are the same gender and back to back which means they are thick as thieves. I wake up to them chirping and chortling with each other every morning. 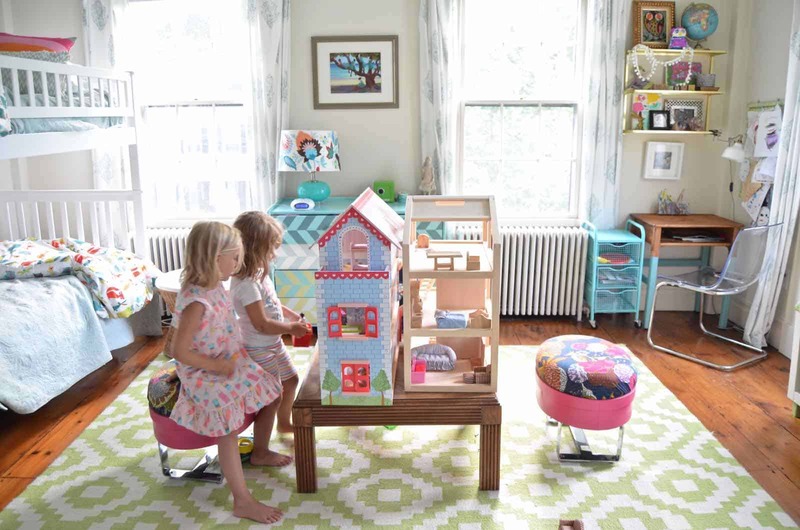 They’ve redecorated their doll houses dozens of times, and they often have an elaborate make-believe going on. Watching them together in that room makes my heart SO full and I can only imagine what memories they’ll make in there together! Thanks Jessica! 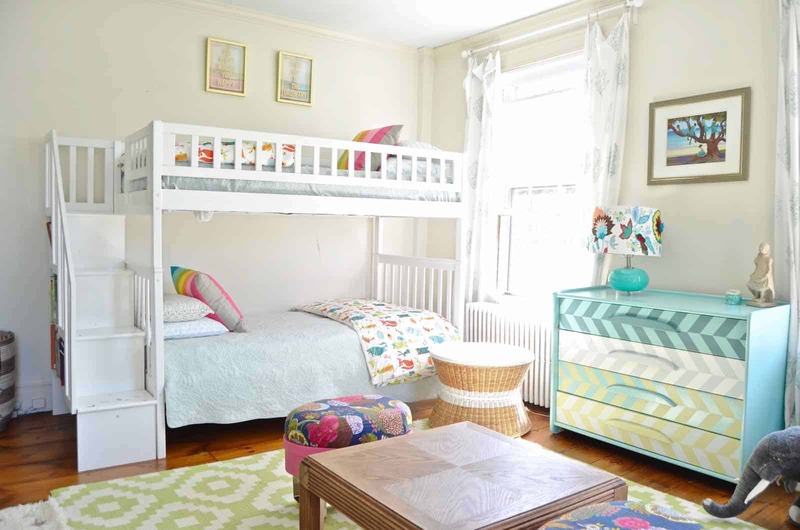 Is there anything cuter then a little girls room?! 🙂 So fun! This is beautiful, Charlotte!! 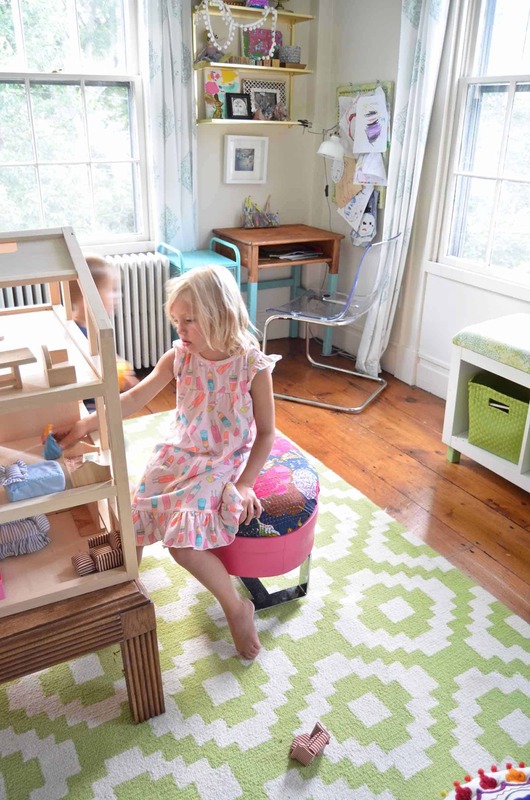 I love the lightboxes on the wall and that colorful floor pouf could not be any cuter or more perfect for their space! DeFinitely a legit splurge piece 😉 I know the girls are going to have a ball in there together! !